At first, before you actually hear it, the idea of a collaboration between Vishwa Mohan Bhatt and Matt Malley might strike you as strange. What, you might wonder, can an Indian virtuoso, who created a 20-stringed hybrid slide guitar he calls the Mohan Veena, possibly have in common with the former bassist of the popular American rock band Counting Crows? But one listen to Sleepless Nights, their tandem effort on World Village Records, released April 13th, quickly answers that question: V.M. 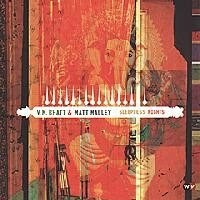 Bhatt and Matt Malley share a vision. Indeed, in retrospect it seems their paths were meant to cross. You can’t experience Sleepless Nights and not feel the love and harmony it radiates. By Easternizing the instrument, customizing its design and shape, and adding strings, Bhatt has enabled the Mohan Veena to take on the role usually performed by the sitar and sarod in Indian classical music, while retaining the Hawaiian and blues slide sounds familiar to Western ears. Bhatt’s 1993 collaboration with Ry Cooder, A Meeting By the River, won a world music Grammy and he has also collaborated with such major talents as Taj Mahal, David Hidalgo, Bela Fleck and Jerry Douglas. Matt Malley, himself a Grammy, Oscar and Golden Globe-nominated songwriter, arrives at this musical juncture from a far different starting point, but he shares with Vishwa a reverence for “the language of the gods.” A co-founder of ’90s sensations Counting Crows, Malley left the band in 2004 to spend more time with his family, produce records and play as a session bassist. A fan of Indian classical music since the early ’90s, Matt met Vishwa in 1998 while on a meditation and yoga pilgrimage in India in 1998. At the suggestion of Sahaja Yoga founder Shri Mataji Nirmala Devi, Malley began to study the Mohan Veena, and a meeting with Vishwa soon followed. The third component on the recording, tabla drummer and percussionist Subhen Chatterjee, is the solid rock that binds Bhatt’s glorious fretwork and Malley’s inventive bass and keyboard playing. A veteran musician who has toured with many of India’s greats and has recorded for Peter Gabriel’s Real World Records, Chatterjee is a virtuoso whose resourcefulness and innate command help propel the music to another level altogether. The pieces that comprise Sleepless Nights reside in a common place where Indian traditional music meets the more cosmopolitan nature of contemporary world music. Influenced by classical ragas, they nonetheless transcend the strict constructs of Indian classical and become something new and exciting in the process. Recorded during a three-night session at Malley’s home studio, Sleepless Nights was initially assembled with Bhatt leading the way melodically and Subhen played along in the studio. “More than 90 percent of Sleepless Nights was improvised,” says Bhatt. “I composed during the recording and performance of the songs. There were no retakes or edits on the Mohan Veena. It was raw; whatever came during the recordings is what was recorded.” Malley composed his own parts and added harmonic structure with his bass and keyboards after the two Indian musicians had left California, perfecting the recording until the finished album emerged. Anyone fortunate enough to hear Sleepless Nights is bound to feel the same way.